Why was it necessary to notify the name change? Wasn’t the change of name automatic on marriage? What was the Liverpool Victoria Friendly Society? The predominant English tradition was that a woman adopted her husband’s surname on marriage and no legal formalities (e.g. deed poll) were required. However, it would be prudent to avoid confusion by telling relevant authorities shortly after the marriage. If the records were updated, claiming rights originally obtained under her maiden name would be much simpler. The date of name change notice is two days after the marriage. 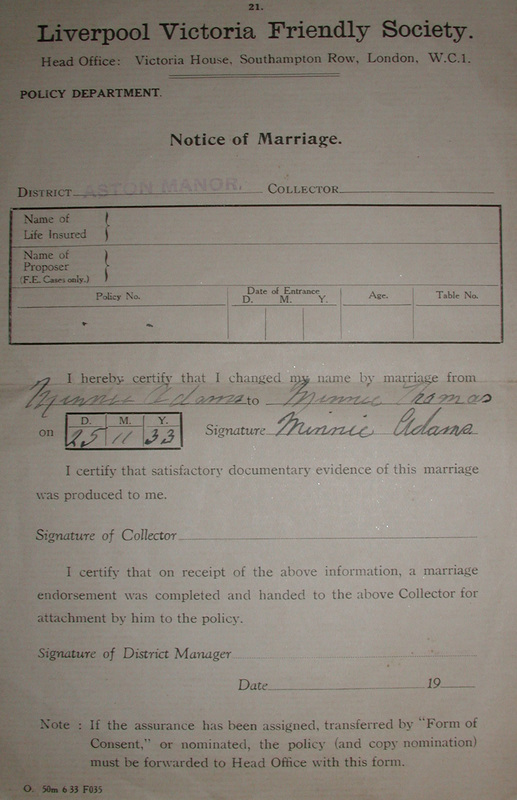 It is likely that Minnie had to produce her marriage certificate before the Society would update its records, so it seems she dealt with this important formality promptly. The Liverpool Victoria Friendly Society was one of the largest and most successful of the “Approved Societies” that administered compulsory health insurance for the working-class, established by National Insurance Act of 1911. By the time of this marriage (1933), administration of pensions and health insurance had been combined (National Health Insurance and Contributory Pensions Act 1932). Minnie could have claimed health, maternity and other benefits, based on her personal contributions while working, and through her husband.